The new mobility paradigms impose to this sector and to the component one to invest in the research of green automated solutions connected with the telematics infrastructure network. It is a dynamic and lively market, with a strong propensity for innovation. This is the picture outlined by the last edition of the Observatory on Italian components, the survey carried out by Turin Trade Chamber, by ANFIA and by CAMI Centre of Ca’ Foscari University in Venice. «In 2016, this sector achieved a turnover of 40 billion Euros, growing by 4.3% compared to the previous year. The export is worth 20 billion Euros and the main destination areas of Italian components are Europe and United States – affirmed Vincenzo Ilotte, President of the Trade Chamber of Turin during the press conference on the Observatory –Besides, the automotive world is in constant evolution: ten years ago, we imagined a market characterized by low-cost vehicles. Today reality is different: companies invest in the autonomous drive, in materials, in infomobility and entertainment. It is a field driven by continuous technological transformations». 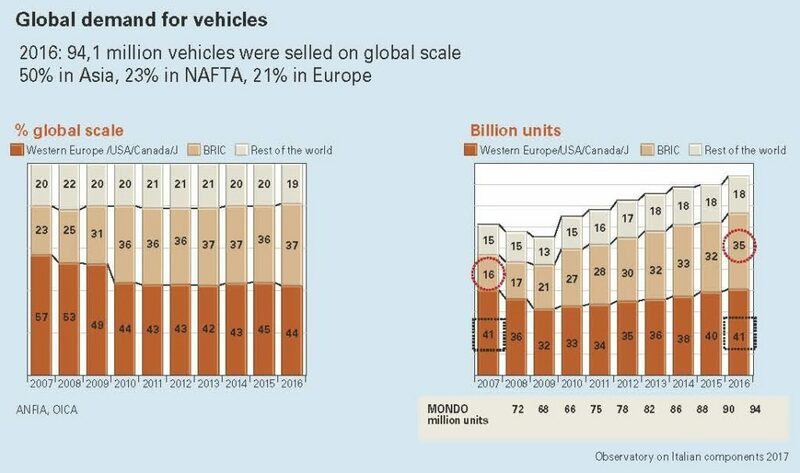 In 2016, 95 million vehicles were produced on a global scale, 22 millions more than in 2007: about half of them were sold in Asia, 23% in Europe and 19% in the NAFTA Area. 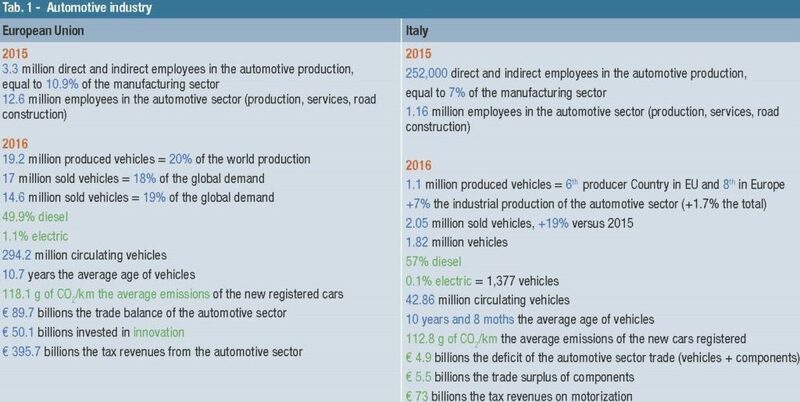 «The data on the 2017-trend show in the first semester a world-scale growth in the production of vehicles by 2.4%, amounting to 45.8 millions, with the 1.8% reduction in Europe and the 4.4% increment in Italy (576,000 units) – underlined Giuseppe Barile, President of ANFIA Component Group – In Italy, where the production of the automotive sector production grew by 7% in 2016, against the +1.7% of the overall industrial production, and the 1.1 million vehicles produced make us rank as the sixth manufacturing Country in EU. Components provide an important contribution also to the trade balance, maintaining a trade surplus for over 20 years, corresponding to 5.5 billion euros in 2016 (+0.3%) and around 3 billions in the first 2017 semester, as confirmation of the consolidated international success». The new trends that characterize the sector, such as the environmental sustainability, will exert an impact on enterprises’ working and business modalities. «Our chain must react and achieve the suitable structure for increasing the competitiveness level through the investments in product and process innovation – added Barile – Concerning this, according to a recent survey, 46% of Italian companies have started projects connected with Industry 4.0 and 29% of them undertook all that already two years ago». Since 2007 until now, the world demand for vehicles, risen by over 30%, has enormously changed: industrialized and “motorized” Countries, historically production areas, have witnessed the decrease of the weight of their markets from 57% to 44%, whereas BRIC (Brazil, Russia, India and China), whose demand has grown by 118% versus 2007, have reached 37% of word sales (it was 23%). In the first 2017 semester, the global demand for vehicles reached 47 million units (+2.6%). In Europe, sales rise by 4.1% also thanks to Russia, which scores +7% after years of consecutive drops. In the same year, in Italy registrations grow by 9%, whereas the year-end forecasts expect 1.98 million registrations approximately (+8%). The world vehicle production, supported by the positive demand trend, in 2016 scored over 95 million units, with +4.7% versus 2015. The world productive increment was by over 4.2 million vehicles, of which 3.5 produced in China. In Italy, both the internal demand and the export have led to over 1.1 million units produced in 2016 (+9%). Compared to 2007, the world production registers, as for registrations, the 30% rise. In the first 2017 semester, according to the estimates by Ward’s Automotive Reports, the production scores the +2.4% growth and for Italy by 4.4%. In 2017, the world production of vehicles is expected to confirm the trend, exceeding 2016 volumes. In Italy the growth is going on, too, having closed the 1st semester 2017 at +7.3 (ISTAT data). 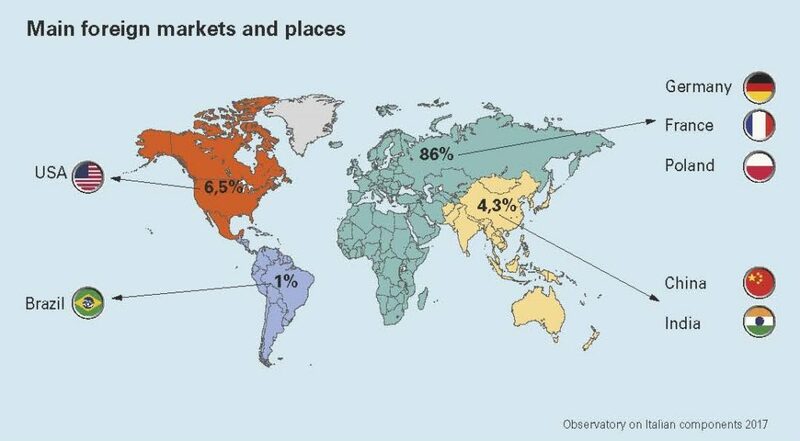 In 2016, 54% of vehicles were manufactured in Asia-Oceania, 23% in Europe and 19% in Nafta area, 4% in the rest of the world. China is the first producer nation in the world, with 30% of the world production, followed by USA (13%) and Japan (10%). The automotive component world is constantly evolving: to take the chain complexity into account, intercepting all the categories of suppliers involved, the investigation has included in its observation range also activities like specialists in telematics and infomobility, motorsport and aftermarket. According to this logic, among automotive component enterprises, we can distinguish: system integrators and module suppliers, at the top of the supply chain with factories located closed to manufacturer’s plants, which implement functional systems or modules, with a high competence level; specialists, producers of parts and components, with such a content of innovation and specificity as to constitute a competitive edge, encompassing also the category of telematics specialists that work at applications connected with infomobility; motorsport specialists that, starting from the fitting out of cars for sports competitions, design and manufacture components (seats, steering wheels and safety belts) or supply solutions adopted for mass productions, too; aftermarket specialists, which implement parts and components directly sold on the market through a distribution network or consortia of spare part suppliers. They can have supply relationships with automotive industries but there are also aftermarket divisions of the same multinationals. Besides subcontractors, which produce standard parts and components according to the specifications supplied by customers and easily repeated by competitors, and in whose category we can identify the companies that execute mechanical machining such as turning, milling, rolling, stamping or treatments (thermal, painting etc. ), the chain is completed by engineering and design activities, protagonists in the devising and design of a car, particularly numerous in Piedmont (55% of the Italian total), which supply services directly to assembling companies or Tier 1 suppliers. The survey, presented by Barbara Barazza, Manager of the Study, Statistics and Price Sector of Turin Trade Chamber, has highlighted that in 2016 all component manufacturers scored good performances: among suppliers, the most dynamic are the specialists in motorsport (+9.5% at Italian level), subcontractors (machining) (+9.4%), E&D (+7.8%) and system/ module providers (+5.6%). In Italy, over 76% of enterprises declare they export: the percentage has grown by one point in the last year (it was 75%). On the whole, 39% of the overall automotive turnover derives from export. EMEA (Europe, Middle East and Africa) is the main addressee of the Italian export, mentioned by 86% of enterprises but the first 5 markets are all in Europe (Germany, France, Poland, Spain and United Kingdom). A sound component industry, thanks to export, geographical and productive diversification and enlargement of destination markets, succeeds in maintaining a high saturation level of the productive capacity, which in 2016 reached the 78% average. The percentage of enterprises that have declared a plant saturation percentage exceeding 80% has grown from 51% in 2015 to over 61% in 2016 and has indistinctively concerned all productive segments of the chain. Sector players look optimistically at the future: for the current year, expectations not only maintain a positive sign but consolidate in comparison with the previous year: 87% of operators declare their optimism (80% in 2015) and confidence pervades all clusters, with particularly rosy forecasts for module and system providers (91% with growth estimates), specialists and E&D (89%) and the aftermarket (80%). 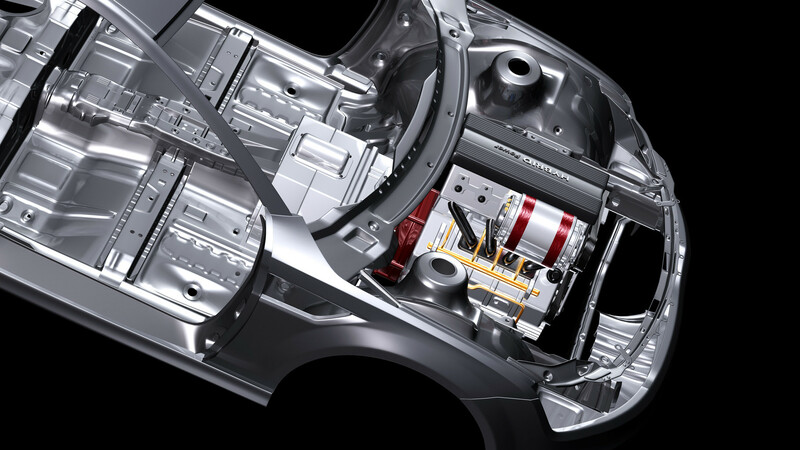 Green, new materials, infomobility, autonomous drive, electric and hybrid motors represent the new directions in the process of transformation of automotive induced activities, like the cost reduction and the process reorganization. Finally, 71% of the sample declare they invest part of their turnover in research and development activities that are prevailingly carried out “in house”. The last part of the press conference on the Observatory was dedicated to a discussion, chaired by Francesco Zirpoli, Center for Automotive and Mobility Innovation, Ca’ Foscari University, on the opportunities and the challenges for the Italian component chain. «The Italian automotive supply chain is living a time of growth and development. However, the mobility world is changing. The Italian component industry will be able to constitute the backbone on which to base the mobility future in Italy if it succeeds in reversing the trend involving lower investments than international competitors in research and development and scarce networking to gain access to new technological competences. As far as the overall Italian situation is concerned, the challenge to be won is maintaining in Italy the design and the production of vehicles, systems and modules with high technological complexity. This requires a trend inversion in innovation investments that currently position Italy in a disadvantaged situation compared to Countries with a similar industrial tradition». Massimo Mucchetti, President of Senate Industry, Trade and Tourism Commission highlighted that in Italy, in industrial ambit, components are becoming more and more important than the implementation of the finished product but it is necessary to invest to be in the technological forefront. Giorgio Elefante, Automotive Sector Leader Italy Price Waterhouse Coopers was then called upon to speak: «There are some key points for the business management: the awareness of challenges, the conscious determination of strategies, the individual and collective professional force and institutions’ support. We need clear rules supporting innovation. The automotive sector is driven by some big changes that will exert an impact on mobility, such as demographic trends and urbanization, the geo-political scenario characterized by a rising climate of protectionism, climatic changes and the shortage of resources, the technological evolution of products and services. Finally, internationalization plays a determinant role and it is necessary to support those enterprises that invest in research and development centres so that they can create sustainable value». Vincenzo Ilotte, General Manager 2A Spa highlighted the great flexibility of the net in our entrepreneurial fabric and how this element can represent a point of attraction. In the opinion of Giuseppe Barile it is necessary to focus on research and development. Ezio Fossati, ZF Senior Vice President FCA & CNH Global Sales Division A has reconfirmed that it is essential to create an eco-system of collaborations: «Technologies evolve so quickly that no company can have all competences in its inside» (Elena Ferrero). Articolo precedenteAlternate or direct current motors?